Manson--Carswell. 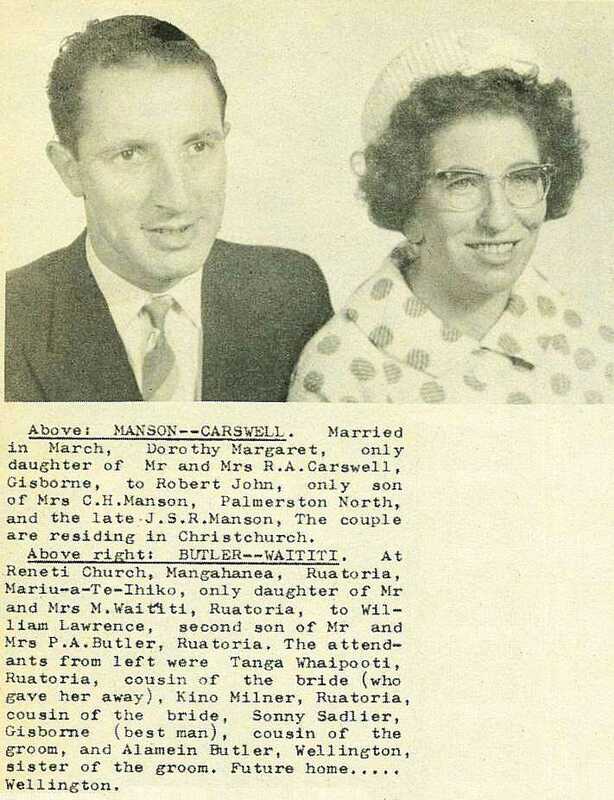 Married in March, Dorothy Margaret, only daughter of Mr and Mrs R. A. Carswell, Gisborne, to Robert John, only son of Mrs C. H. Manson, Palmerston North, and the late J. S. R. Manson, The couple are residing in Christchurch. Butler--Waititi. At Reneti Church, Mangahanea, Ruatoria, Mariu-a-Te-Ihiko, only daughter of Mr and Mrs M. Waititi, Ruatoria, to William Lawrence, second son of Mr and Mrs P. A. Butler, Ruatoria. 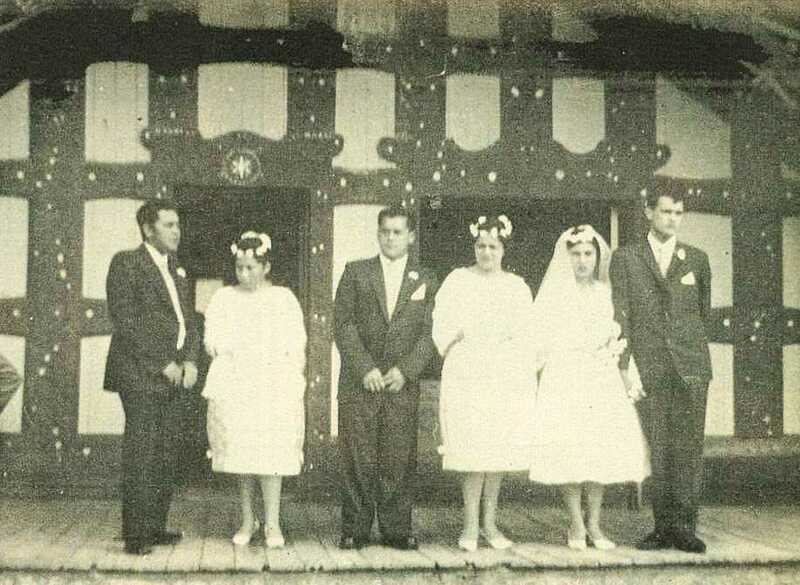 The attendants from left were Tanga Whaipooti, Ruatoria, cousin of the bride (who gave her away), Kino Milner, Ruatoria, cousin of the bride, Sonny Sadlier, Gisborne (best man), cousin of the groom, and Alamein Butler, Wellington, sister of the groom. Future home.....Wellington. 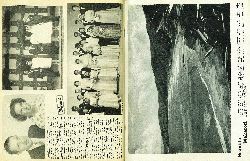 Nukunuku--Wilkinson. 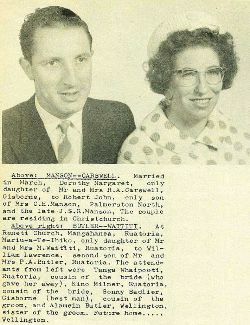 At Poho-O-Rawiri, Sandra, daughter of Mr and Mrs T. Wilkinson, 10 Dominion Rd., to Whare Hawea Nukunuku, nephew of Mr and Mrs M. Rapana, 122 Crawford Rd. 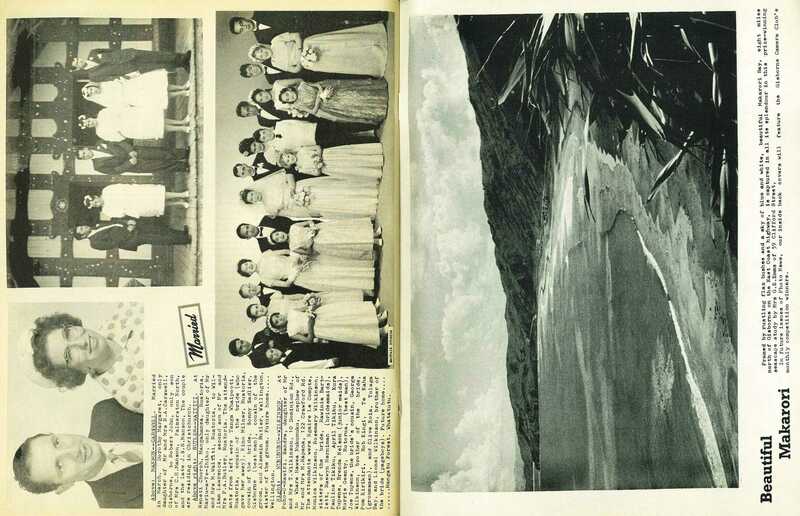 The attendants were Ngaire Le Compte, Monica Wilkinson, Rosemary Wilkinson, sisters of the bride, Rawinia Bartlett, Raewyn Herniman (bridesmaids), Pauline Tikiku, April Tikiku, Kura Tupene, Brenda Nelson (junior maids), Morrie Geenty, Rotorua, (best man), Joe Tupene, the bride's cousin, George Wilkinson, brother of the bride, Pom Kirikiri, Bob Kingi, Te Kaha (groomsmen), and Clive Koia, Tolaga Bay, and Lionel Wilkinson, brother of the bride (pageboys). Future home,.........Mangatu Forest, Whatatutu.